Pumpkin cheesecake bars anyone? You won’t even know that it’s low-carb, sugar-free, gluten-free and very easy to make at home. The best part about this recipe is that you can turn it into a pumpkin cheesecake pie or a round cheesecake as it’s versatile and because sometimes I feel like slice of pie instead of a bar. The secret ingredient in this recipe is LOVE, haha no it’s the full-fat sour-cream which adds that moisture and tangy flavour that you want in a pumpkin pie. You will also find the very thin almond flour crust has a slight almond extract flavour which we adore but is optional. I’ve read so many comments on social media from low-carb, keto foodies that they would rather buy their foods then make them. Honestly, it’ s dead easy to do and you will save yourself LOADS of money. Anything that says gluten-free, low-carb, keto and sugar-free will add a chunk to your grocery budget so don’t fear the kitchen. Any food blogger who doesn’t post at least one or two pumpkin recipes in the Fall likely doesn’t eat pumpkin or just can’t stand the sight of seeing any more pumpkin recipes online. I on the other hand am in the middle, I don’t like them but I don’t hate them..
One of the best things about the Fall is that pumpkin is in full swing as are tonnes of other squash that are inexpensive to buy. The weeks leading up to Halloween you will notice the price of pumpkins drastically drop especially the pie pumpkins. We purchased one for a whopping $0.99 this week which will end up roasted and stashed in the freezer for next season when I start my pumpkin recipe marathon again. 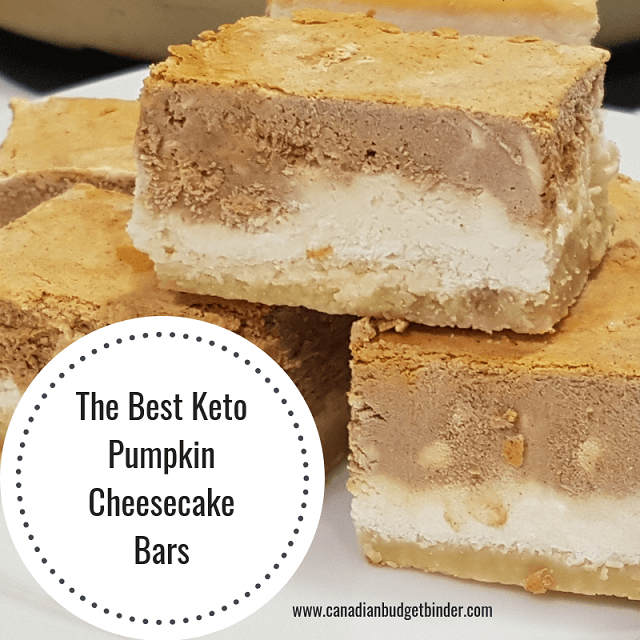 Actually, this year I didn’t do too much in the way of pumpkin for Mrs. CBB but I did manage to work on these pumpkin cheesecake bars which turned out delicious. I’m not a huge fan of pumpkin so coming from me that’s like getting a high-five times two. 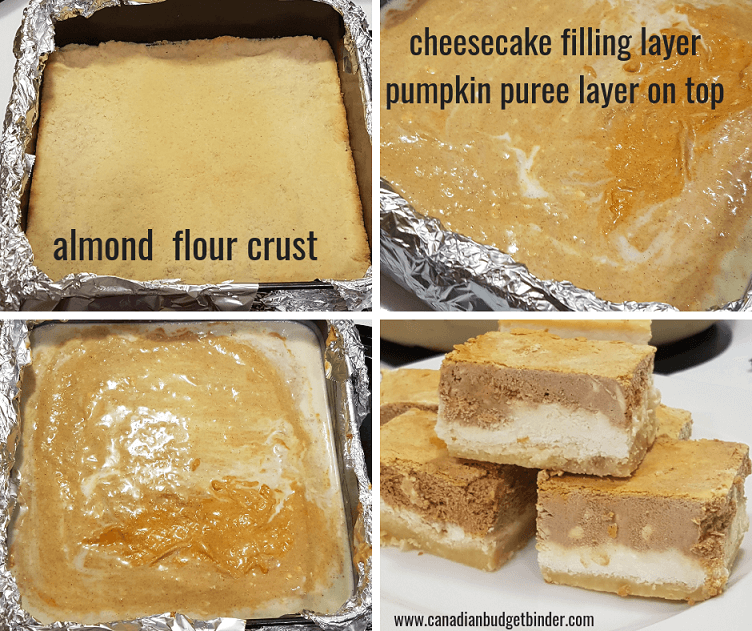 In order to keep the pumpkin cheesecake bars gluten-free and low-carb we went with an almond flour crust but a thin one. It’s not as thick as the caramel cheesecake or lemon squares but you can most certainly make it as thick as you’d like. We used a square spring-form pan for this recipe which I ended up chucking in the bin after we were done using it as the enamel was coming off and I didn’t want it to end up in my baking. This is a good time to say, buy good bakeware such as this Norpro 9-Inch by 9-Inch Nonstick Square Springform Pan . It doesn’t have to be over the top expensive but be aware of what you are buying. This was my mistake as I found it at Value Village and was more interested in the shape of the spring-form pan than I was the quality. Any how I managed to get one beautiful pumpkin cheesecake out of it so I’m happy about my lesson learned. It was a good thing it only cost me $1.99. If you don’t fancy making bars you can make one giant cheesecake instead. I recommend that you line your pan with Parchment Paper as well wrap tin-foil on the outside of the pan as it will sit in a small water-bath to bake. I’ve always found cheesecake to be moist and delicious when water-bathed rather than just sat in the oven on a rack. Feel free to use a large, round spring-form pan if you’d like or a 13 x 9 Inch Oblong Pan or 9×11 baking pan . Either way whatever pan you use it will work out as the recipe stays the same. The possibility of a thicker crust or thicker filling may be your end result. I know, horrible right? You will want to watch your cheesecake though as ranges differ in heat. You will know when your crust is done as it is a golden brown colour. The pumpkin cheesecake bars will jiggle and set on top or if you touch it you will leave a slight imprint. Remember that the crust is already baked and all you are really doing is baking the cheesecake layer and setting the pumpkin layer. Once you have your almond flour butter crust pressed into your pan, baked and cooling go on to make your cheesecake batter and your pumpkin spice puree and layers. I’m one to take things slower in the kitchen because I hate burning anything and am always keeping an eye out on my oven. 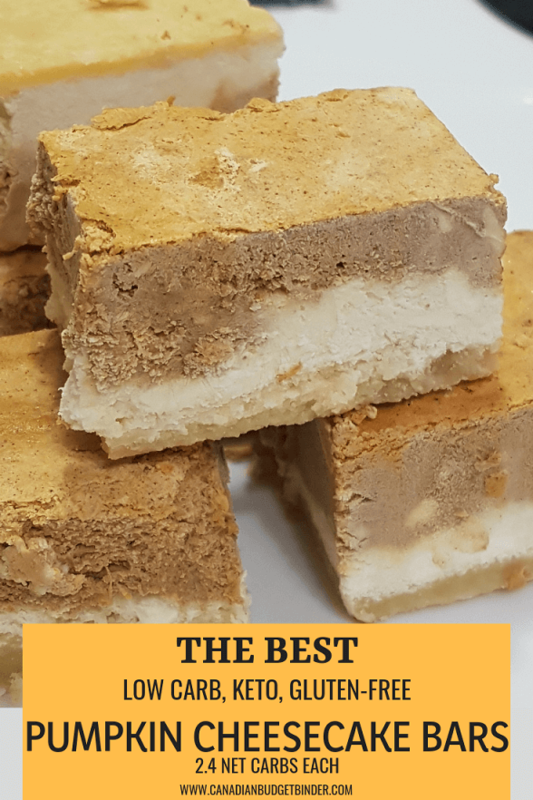 For our pumpkin cheesecake bars we used cream cheese and mascarpone cheese but you can simply use 3 blocks or cream cheese which will work just the same. The mascarpone has a bit of a sweet taste to it and we got if for 50% off so that’s why we used it. It’s not often we find a great deal like that on a premium product. I also suggest having it left out at room temperature for at least an hour as it’s far easier to work with and creates a silky finish to your pumpkin cheesecake bars. We used Erythritol for the sweetness in this recipe which is a natural sweetener but we used the powdered version which we blended in our Coffee Grinder . A simple coffee-grinder/spice grinder is an essential kitchen tool for any low-carb, keto foodie as you can take granular sweetener and grind it up to a powder which works best in some recipes and much cheaper. I have a homemade pumpkin spice that I make and keep in a jar which is simply ground cinnamon , Organic Ground Cloves and Organic Ground Ginger . Again, the grinder is wonderful for this purpose. Line your 9x13 baking dish or spring-form pan with parchment paper (I use a bit of spray to help it stick) and then wrap the outside walls and underneath of your pan with tinfoil. In a large bowl add your almond flour, cold butter cubes, salt and extracts. Using your fingers or a pastry blender combine the butter with the flour until it resembles pea size balls. Press the mixture into the bottom of your baking dish and spread evenly. Bake for 15 mins or until the crust is a light golden colour. It doesn't take long. Take it out and while it cools you can make the pumpkin and cheesecake fillings but preheat oven to 350 degrees. In your stand mixer add your softened cream cheese, sour cream and mix to combine. One at a time add your eggs then salt and sweetener until silky smooth. A couple of minutes should do. Pour half the mixture on top of the cooled almond flour crust and spread evenly. In your stand mixer again with the other half add pumpkin puree, cinnamon, cloves, ginger and powdered sweetener and mix to combine. Pour this gently over the top of the cheesecake mixture and spread evenly. Don't worry if it mixes in a bit but try to keep the layers separate. Using a large baking pan or roasting pan fill it with 2 inches of water and set your cheesecake pan inside. Bake at 350 degrees for one hour but keep an eye out on it as ovens differ in temps. It should be firm at the top when done like a pumpkin pie. Cool completely and enjoy. It's best enjoyed the next day as the flavours have a chance to come together so you can make this recipe a day in advance. You can freeze up to 6 months but they won’t last that long. Mrs. CBB has one out every day for her breakfast fat bomb and I sneak one every once in a while. If you really want to get fancy add some whipped cream on top but honestly they are perfect as they are at room temperature. Happy Keto Fall to all!!! If you fancy some sugar-free vanilla ice-cream or whipped cream on top you might as well go all out or they are perfect just as they come. 2 questions. 1. Where do you find erythritol? I can only find blends at bulk barn. 2. You make a point of emphasizing almond flour not meal. I only found ground almonds at bulk barn which they tell me is the same as flour. You can find both on Amazon Canada as well online. You can find the Almond flour in 2kg bags at Costco for 16.99 which is the best deal I’ve found or on Amazon for $27.99. The almond meal is more chunky and the almond flour feels like flour. I hope that helps a bit to determine each. Oh man what I did I say. I better go read it now. You’re laughing at me. haha. Oh Susan I was laughing so hard it hurt. Thanks for pointing that out. Should have called them Magic Pumpkin Cheesecake Bars lol.